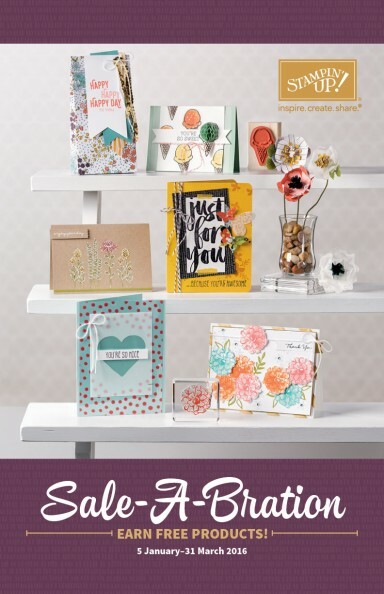 2016 Occasions catalogue is LIVE! Plus SaleABration. I hope that you are all geared up for today’s excitement – the Brand new 2016 Occasions catalogue is now LIVE! And, just as excitingly, SaleABration is also active! Which is great news. As in previous years, SaleABration is a limited period for which you can earn free items for every £45 you spend on Stampin’ Up! products! So if you spend £90, you can have 2, for £130 you get 3, etc. This is a great time to boost your SU collection, and get some goodies for nothing. The goodies which can be earned with your spending are all exclusive and limited-edition, and this year, similarly to last year there are time-limited items. There are 3 items in the current SAB line up which will only be available for the first part of SaleABration – until February 15th – so be sure to check those out. And obviously all of your purchases from the brand new offerings in the Occasions catalogue, as well as the lovely carry-over items, and the weekly deals items, and anything on the clearance rack will all count towards that total spend on which you can earn SAB items!